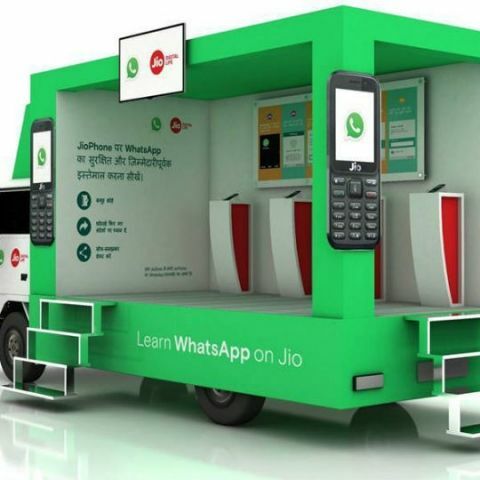 The collaboration between WhatsApp and Jio includes street plays to engage people and apprise them of how to use the app in a responsible way on the JioPhone. WhatsApp and Jio have collaborated to start an educational campaign that will focus on teaching people how to connect with friends and family in a simple, secure, and reliable manner through WhatsApp on the JioPhone and JioPhone 2. The campaign will run in 10 cities in several states, including Uttar Pradesh and Rajasthan, among others. According to the company, the campaign will start from October 9 and several vans bearing WhatsApp and Jio branding will travel across the cities. “Jio has an important role in driving India’s digital revolution by empowering millions of Indians. We are excited to be a part of this journey and help organise a campaign that educates people on how to communicate in a simple and safe way with WhatsApp,” a WhatsApp spokesperson said in a statement. WhatsApp has 1.5 billion people globally on its platform and India is its largest user market with 200 million active monthly users. As a part of the campaign, WhatsApp says that there will be events at each city to show people how to use WhatsApp safely and responsibly. The collaboration includes street plays, a popular art form of outreach in rural areas, to engage people and guide them “on the meaningful and responsible ways” to use WhatsApp on JioPhone. The companies have also developed video tutorials and informative leaflets, which are available online and in Jio Stores in 11 Indian languages including Hindi, Bengali, and Marathi. Last month, the Facebook-owned messaging service was made available for the JioPhone and JioPhone 2. Those who haven’t downloaded WhatsApp on their JioPhones or/and their JioPhones 2 can do it by visiting the AppStore and clicking on “download”. WhatsApp has built a new version of its messaging app for KaiOS on which the JioPhones run. The app has features like the ability to send photos, videos, and of course, end-to-end encryption. Users can also send voice messages through WhatsApp on the JioPhone.